This article is about the plant. For the drink, see Mate (drink). Yerba mate, Ilex paraguariensis, is a species of holly (family Aquifoliaceae) native to subtropical South America. It grows in Argentina, southern Paraguay, western Uruguay and southern Brazil. The Simple English Wiktionary has a definition for: yerba mate. There are many brands and types of yerba, with and without twigs, some with low powder content. Some types are less strong in flavor (suave, "soft") and there are blends flavored with mint, orange and grapefruit skin, etc. Mate products are sometimes marketed as "caffeine-free" alternatives to coffee and tea, and said to have fewer negative effects. This is often based on a claim that the primary active xanthine in mate is "mateine". This is wrongly said to be a stereoisomer of caffeine (it is not chemically possible for caffeine to have a stereoisomer). "Mateine" is an official synonym of caffeine in the chemical databases. So mateine is caffeine. Researchers at Florida International University in Miami have found that yerba mate does contain caffeine, but some people seem to tolerate a mate drink better than coffee or tea. This is because, caffeine aside, mate contains different chemicals from tea or coffee. Studies of mate, though limited, have shown evidence that the mate xanthine cocktail is different from other plants containing caffeine, in its effects on muscle tissue, as opposed to those on the central nervous system. Mate has been shown to have a relaxing effect on smooth muscle tissue, and a stimulating effect on myocardial (heart) tissue. Mate's negative effects are anecdotally claimed to be of a lesser degree than those of coffee, though no explanation for this is offered, except for its potential as a placebo effect. Many users report that drinking yerba mate does not prevent them from being able to fall asleep, as is often the case with some more common stimulating beverages. It enhances their energy and ability to remain awake at will. However, the net amount of caffeine in one preparation of yerba mate is typically quite high, in large part because the repeated filling of the mate with hot water is able to extract the highly-soluble xanthines extremely effectively. It is for this reason that one mate may be shared among several people and yet produce the desired stimulating effect in all of them. In-vivo and in-vitro studies are showing yerba mate to exhibit significant cancer-fighting activity. Researchers at the University of Illinois (2005) found yerba mate to be "rich in phenolic constituents" and to "inhibit oral cancer cell proliferation". 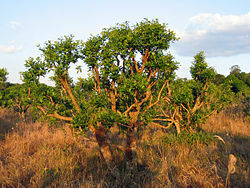 Wikimedia Commons has media related to Ilex paraguariensis.